Hotkeys are an efficient method of selecting commands on a keyboard. However, these shortcuts are often underused by users. We present Metamorphe, a novel keyboard with keys that can be individually raised and lowered to promote hotkeys usage. 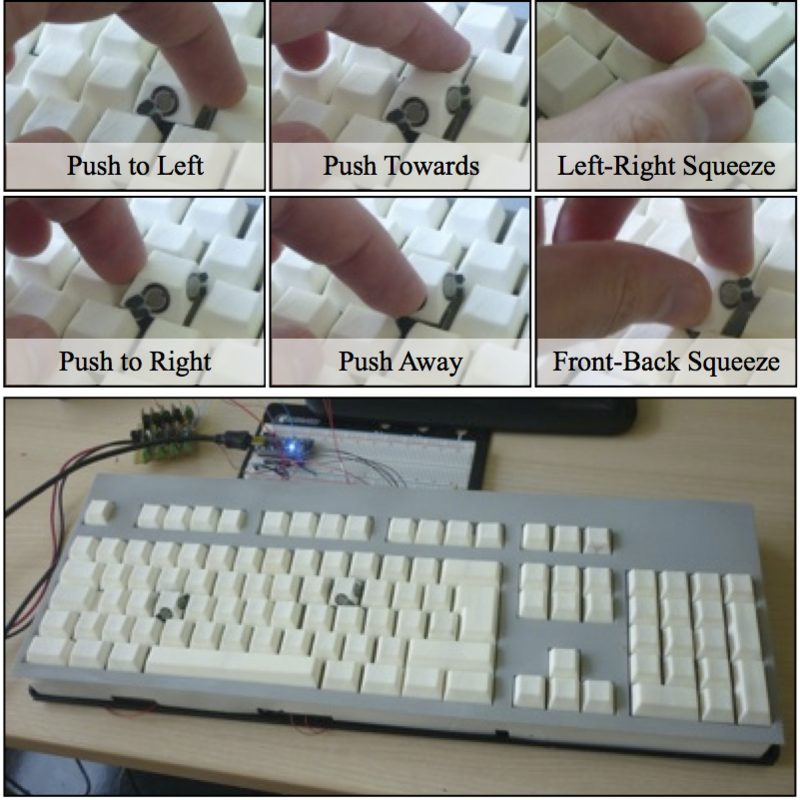 MÃƒÂ©tamorphe augments the output of traditional keyboards with haptic and visual feedback, and offers a novel design space for user input on raised keys (e.g., gestures such as squeezing or pushing the sides of a key). We detail the implementation of Metamorphe and discuss design factors. We also report two user studies. The first is a user-defined interface study that shows that the new input vocabulary is usable and useful, and provides insights into the mental models that users associate with raised keys. 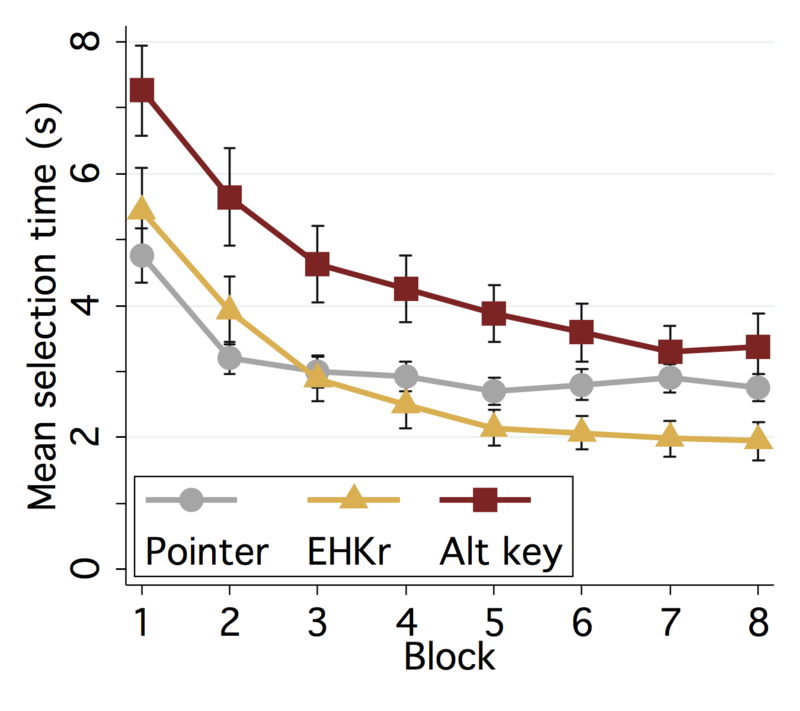 The second user study shows improved eyes-free selection performance for raised keys as well as the surrounding unraised keys. 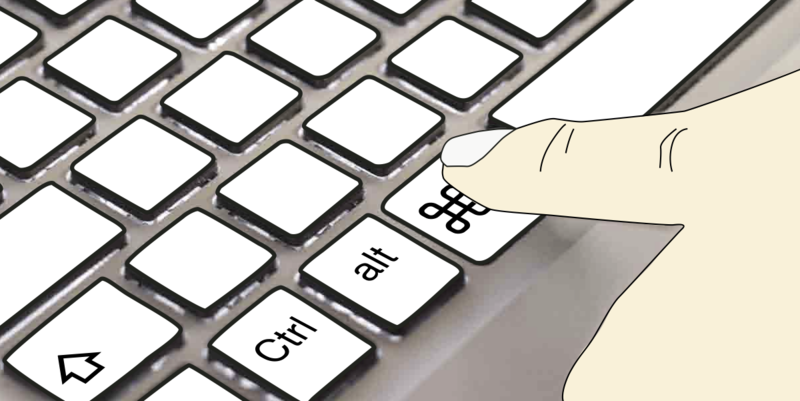 a) The Metamorphe keyboard raises a subset of hotkeys when users press the CTRL key (image from S. Malacria). b) Each key can be individually raised with an embedded solenoid, and contains force sensors that allow a variety of novel gestures to be performed on the key. c d e) For example, the Ã¢Â€Â˜FÃ¢Â€Â™ key can be pushed down to select Ã¢Â€ÂœFindÃ¢Â€Â�, or pushed left or right to select variations of that command. Top: The physical manipulations that can be detected on each key. Bottom: Metamorphe prototype. Heat map of selection speed (in s) for each target keys. The two raised keys are outlined. Insets show speeds for Top Push and the directional pushes on the raised keys. Keyboard shortcuts allow fast interaction, but they are known to be infrequently used, with most users relying heavily on traditional pointer-based selection for most commands. 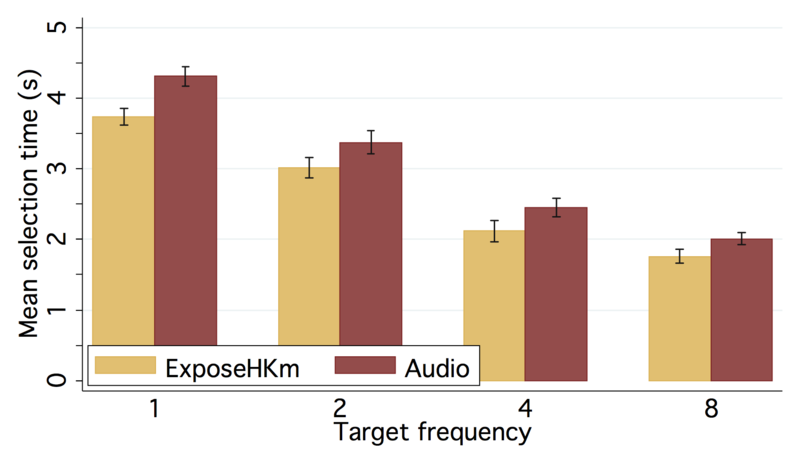 We describe the goals, design, and evaluation of ExposeHK, a new interface mechanism that aims to increase hotkey use. 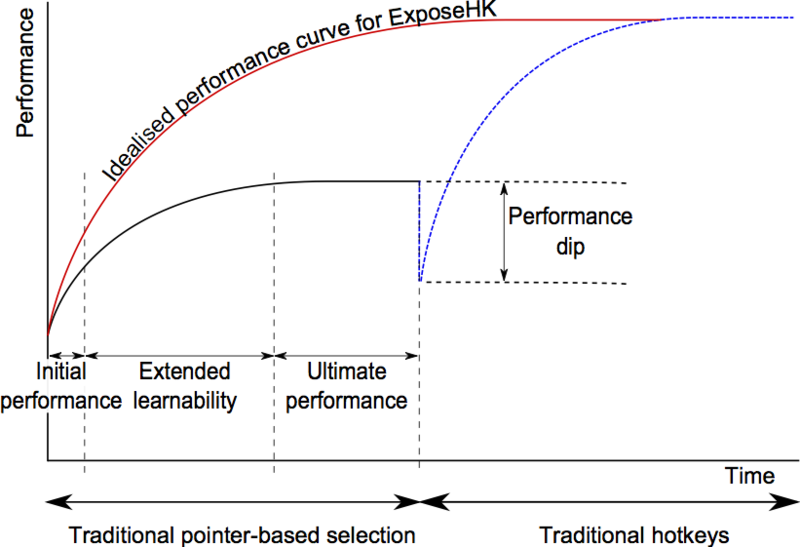 Ex- poseHKÃ¢Â€Â™s four key design goals are: 1) enable users to browse hotkeys; 2) allow non-expert users to issue hotkey commands as a physical rehearsal of expert performance; 3) exploit spa- tial memory to assist non-expert users in identifying hotkeys; and 4) maximise expert performance by using consistent short- cuts in a flat command hierarchy. ExposeHK supports these objectives by displaying hotkeys overlaid on their associated commands when a modifier key is pressed. 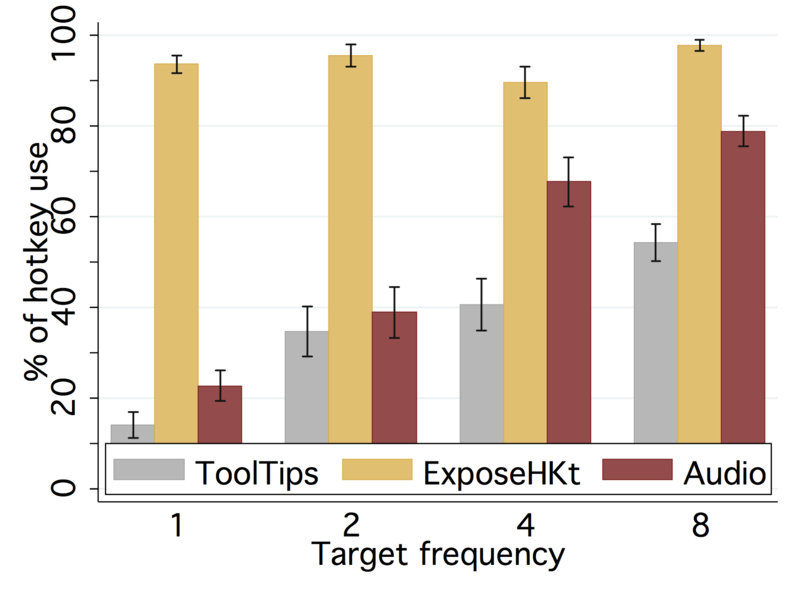 We evaluated Ex- poseHK in three empirical studies using toolbars, menus, and a tabbed Ã¢Â€Â˜ribbonÃ¢Â€Â™ toolbar. 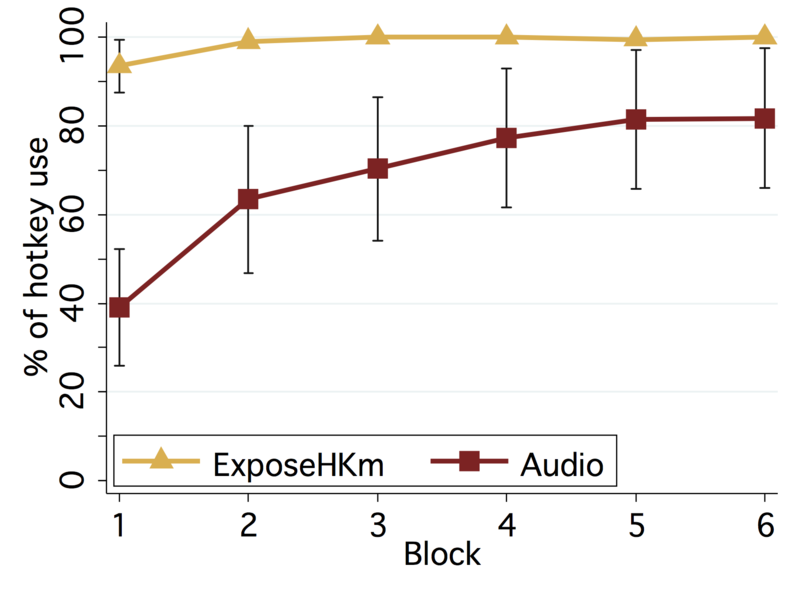 Results show that participants used more hotkeys, and used them more often, with ExposeHK than with other techniques; they were faster with ExposeHK than with either pointing or other hotkey methods; and they strongly preferred ExposeHK. 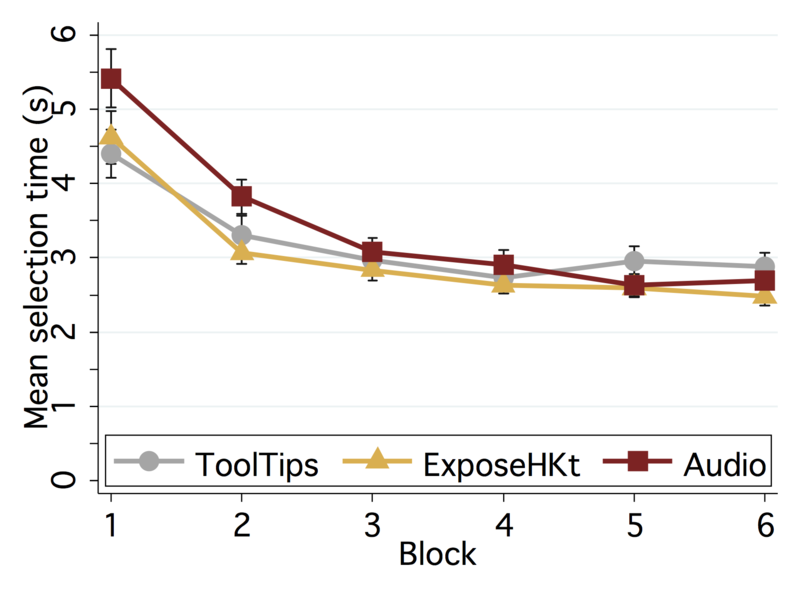 Our research shows that ExposeHK can substantially improve the userÃ¢Â€Â™s transition from a Ã¢Â€Â˜beginner modeÃ¢Â€Â™ of interaction to a higher level of expertise. 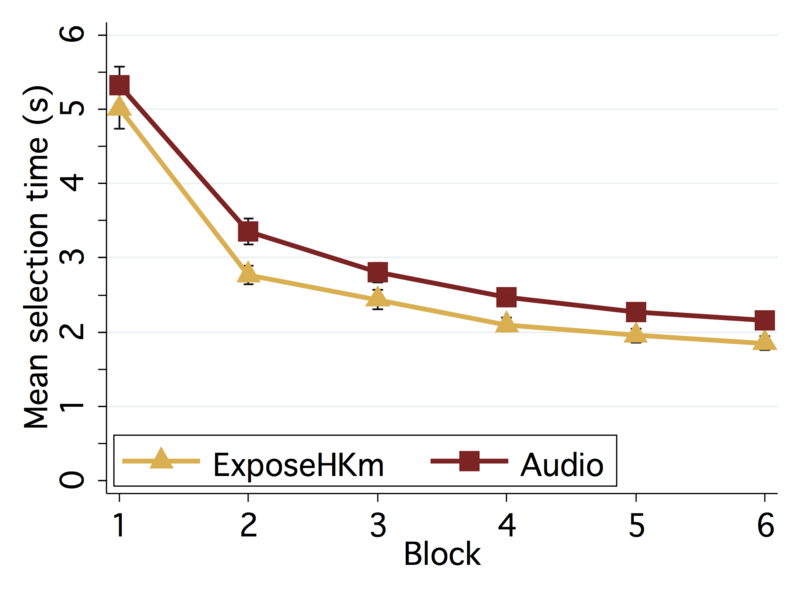 Intended learning curve for ExposeHK, compared with modal- ity switching (adapted from ). 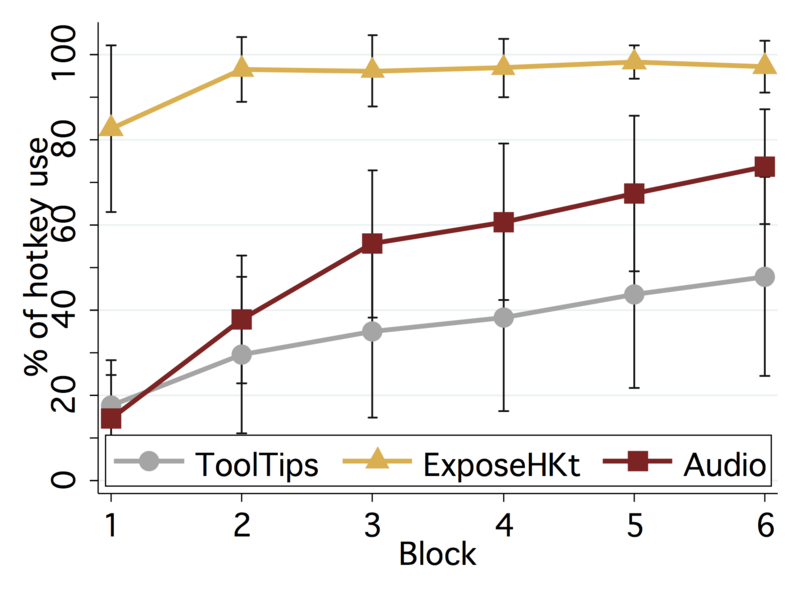 Study 1 (Toolbar): % hotkey use by block. 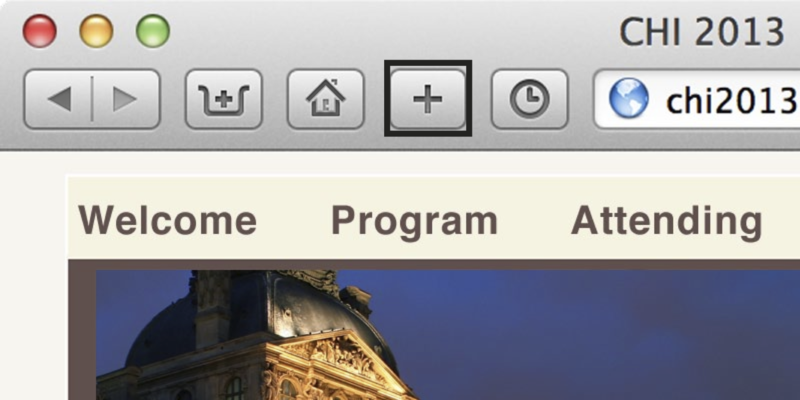 Study 1 (Toolbar): mean time by block. 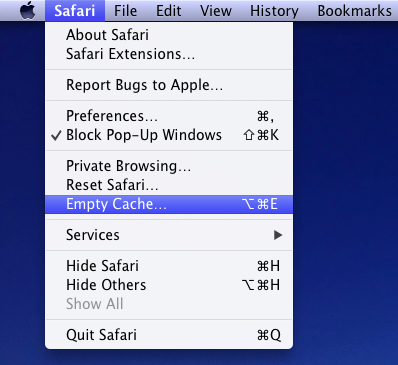 The Safari menu would overlap with File, Edit, View and History menus. 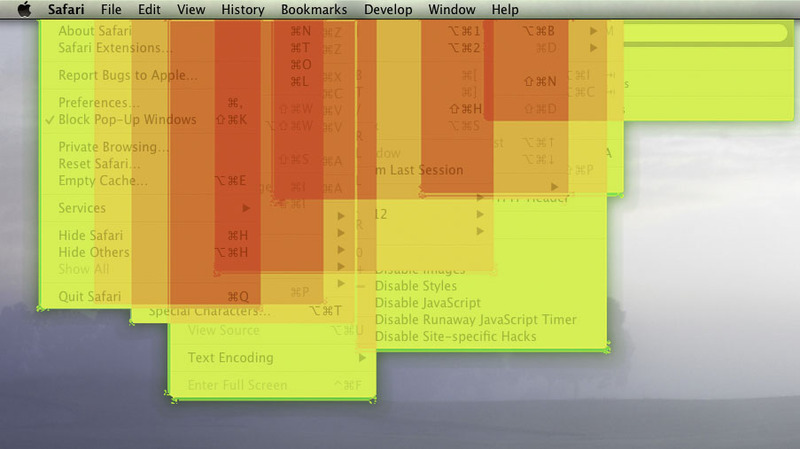 Heat map of Safari menus overlapping (red/dark means more overlap). 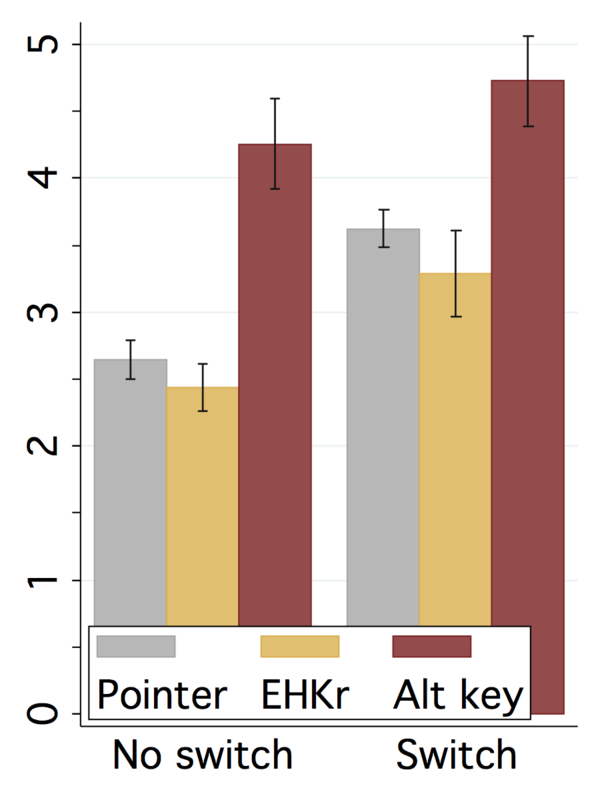 Study 2 (Menus): % hotkey use by block. Study 2 (Menus): mean time by block. Mean selection time (s) per block (left) and condition (right). Science Daily. ExposeHK â€˜Computer Program Lets Users Learn Keyboard Shortcuts With Minimal Effortâ€™. http://www.sciencedaily.com/releases/2013/09/130930093728.htm. Sep. 30, 2013. Christian Kahle. WinFuture. ExposeHK soll User zur Shortcut-Nutzung bewegen. http://winfuture.de/news,78090.html. Sep. 30, 2013. Lernprogramm fÃ¼r TastaturkÃ¼rzel, Wiler Zeitung, http://www.wilerzeitung.ch/aktuell/digital/Lernprogramm-fuer-Tastaturkuerzel;art119505,3555651 1/10/13. Golem.de : http://www.golem.de/news/softwareergonomie-hilfe-fuer-tastenkuerzel-muffel-1310-101882.html 1/10/13 Hilfe fÃ¼r TastenkÃ¼rzel-Muffel by Andreas Donath. Phys.org : http://phys.org/news/2013-09-users-keyboard-shortcuts-minimal-effort.html 30/09/13 'Computer program lets users learn keyboard shortcuts with minimal effort'.